Canmore winters are fun and full of magic. Every February we come together as a community during the Canmore Winter Carnival to celebrate the best parts of our unique winter lifestyle. With two weeks of indoor and outdoor events and experiences, the Canmore Winter Carnival is a favourite for locals and visitors alike. Enjoy ice carving competitions, kids’ ice carving , skating parties, street hockey, log sawing competitions, the always entertaining pooch parade, art crawls and the popular Snowy Owl Kid N’ Mutt races. 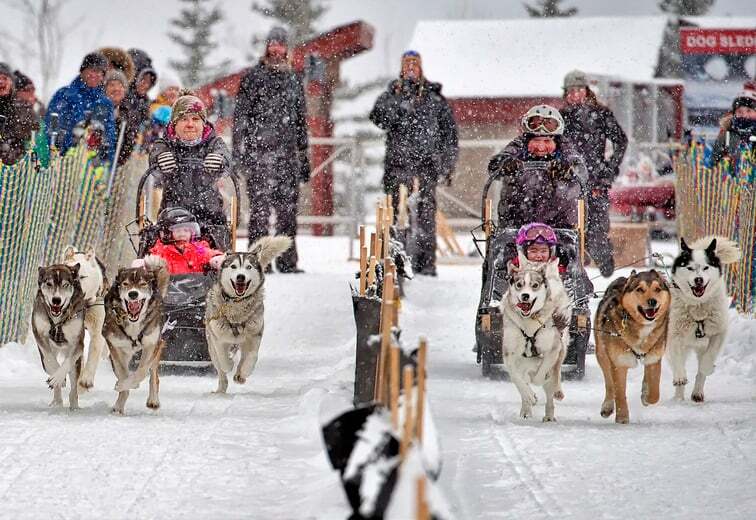 Ice slides, family activities and the chance to explore one of the most fun festivals during the winter in Edmonton, the Flying Canoe Volant festival is full of new things to explore. Art and light installations, Camp Metis, a winter patio and more – it’s a must do to kick off February! Experience amazing ice carvings, music, art, food, beverages and special activities throughout Old Strathcona during Boardwalk Ice on Whyte. Consider yourself invited to the Town of Sylvan Lake’s Winterfest! It’s a weekend of winter fun for the entire family on Saturday, February 16, 2019. Find family Fun beginning 12:00 PM – 3:00 PM at the east side of the Pier, watch a polar bear dip and take in the early fireworks to finish the day! A day jam-packed with family-friendly activities, head to Fort Calgary to take in stories told by a Blackfoot knowledge keeper in a tipi and enjoy a cabane à sucre. There is even a screening of Alexander and the Terrible, Horrible, No Good, Very Bad Day at 2:00pm.